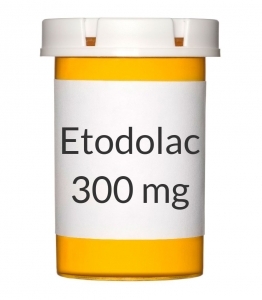 USES: Etodolac is used to relieve pain from various conditions. It also reduces pain, swelling, and joint stiffness from arthritis. This medication is known as a nonsteroidal anti-inflammatory drug (NSAID). It works by blocking your body's production of certain natural substances that cause inflammation. If you are treating a chronic condition such as arthritis, ask your doctor about non-drug treatments and/or using other medications to treat your pain. See also Warning section. HOW TO USE: Read the Medication Guide provided by your pharmacist before you start using etodolac and each time you get a refill. If you have any questions, ask your doctor or pharmacist. Take this medication by mouth as directed by your doctor, usually 2 or 3 times a day with a full glass of water (8 ounces/240 milliliters). Do not lie down for at least 10 minutes after taking this drug. To prevent stomach upset, take this medication with food, milk, or an antacid. The dosage is based on your medical condition and response to treatment. To reduce your risk of stomach bleeding and other side effects, take this medication at the lowest effective dose for the shortest possible time. Do not increase your dose or take it more often than directed. For ongoing conditions such as arthritis, continue taking this medication as directed by your doctor. If you are taking this drug "as needed" (not on a regular schedule), remember that pain medications work best if they are used as the first signs of pain occur. If you wait until the pain has worsened, the medication may not work as well. For certain conditions (such as arthritis), it may take up to two weeks of taking this drug regularly until you get the full benefit. Tell your doctor if your condition does not improve or if it worsens. NOTES: Do not share this medication with others. Laboratory and/or medical tests (such as blood pressure, complete blood count, liver/kidney function) may be performed periodically to monitor your progress or check for side effects. Consult your doctor for more details. If you have arthritis, lifestyle changes (such as weight loss if overweight, strengthening/conditioning exercises) may help improve your flexibility and joint function. Consult your doctor for specific instructions. MISSED DOSE: If you are taking this drug on a regular schedule (not just "as needed") and you miss a dose, take it as soon as you remember. If it is near the time of the next dose, skip the missed dose and resume your usual dosing schedule. Do not double the dose to catch up.